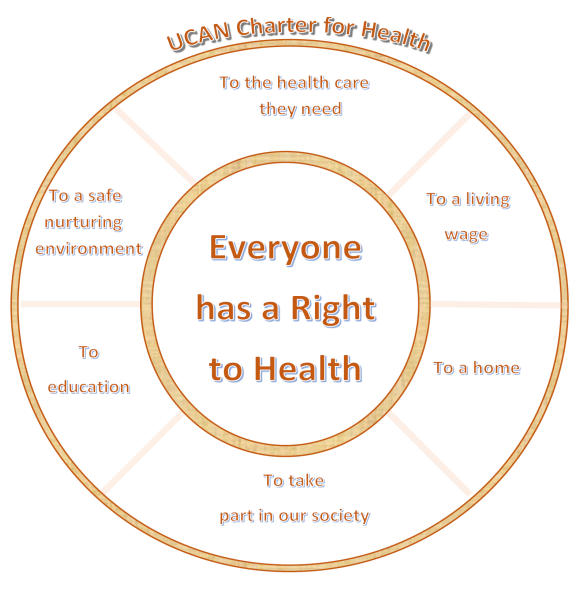 UCAN believes all people have a right to health. That right is being denied to many in Aotearoa/ New Zealand, through poor access to health services, an unfair economic and education system that strongly favours the wealthy over the poor, inadequate and unhealthy housing, poor living environments that alienate vulnerable sections of the community. We have not met our Treaty obligations. We believe as a nation we can and must do better than this. Free primary medical care available in every community. One million people have an unmet need for primary medical care. The cost of care is the biggest barrier, including the cost of drugs. There is low availability of primary medical care services, particularly in deprived areas. Barriers are bigger for those with chronic conditions, especially mental illness. A primary health care approach with a focus on equity and social justice is required across the health system. Support a living wage and income for all, including beneficiaries. The gap between the rich and the poor is rapidly growing in New Zealand and this is bad for our health. More and more New Zealanders in work don’t get paid enough to meet their needs, to eat healthy food, and live dignified and healthy lives. Just to survive, many are left with no time for leisure or opportunity to participate in society. In addition, poverty is health damaging reality for many beneficiaries, and especially for 28% of our children who live in poverty. Support affordable, safe and healthy housing. We are failing as a nation to adequately house our children and other vulnerable groups. They are exposed to housing conditions that damage their health and are not fit to live in. You need a Warrant of Fitness for a car, but not a house. People with severe mental illness are often living in substandard temporary housing with insecure tenure. They have been betrayed by a failed market model for housing provision. Support community centres, drop in centres, with free internet connectivity and public transport. We are denying more and more groups the right to actively take part in our society. More people are working are working longer hours, leaving less time for involvement in their communities. We used to house people with severe mental illness in asylums. This role has shifted to the community, but the social contract that community support would be there, has been broken. Support improved access to healthy food, water and air. Regulate and tax foods full of sugar, fat and salt. Ban advertising of unhealthy foods and alcohol. Protect our water and the air we breathe from contamination.. Exposure of children to foods that are harmful to their health, and unrestricted marketing of unhealthy products are now leading causes of later illness. Our water and the air we breathe needs to be protected from contamination, as does the physical environment from which they are generated. Support accessible educational opportunities for all. Student loans, unequal and unfair outcomes for children from poor communities, reduced educational opportunities for the elderly and beneficiaries are all opportunities lost. What does a “Right” mean? An entitlement that humans have by the fact of being human, such as the right to life and the right to be free from torture or degrading treatment. The highest attainable standard of health is a fundamental right of every human being. Health is a reflection of a society’s commitment to equity and justice. Health and human rights should prevail over economic and political concerns. Can the country afford free health care? Improved access to primary health care will reduce inappropriate use of hospitals, and help to keep health care costs down overall. Healthier people in the community also has an economic benefit. What is Primary Health Care? The main ideas are; that health care is focused on health needs; involves an enduring personal relationship between health workers and the community, particularly for those people with a chronic illness; is comprehensive (not just one illness) continuous (no barriers for patients needing care in both hospitals and the community) and person centred; responsibility for the health of everyone in the community at all stages of life; tackles the determinants of ill-health; and people are partners in managing their own health and that of their community. Primary Health Care is a social justice and pro equity approach to health care described in the World Health Organisation’s Alma Ata Declaration of 1978 and updated by WHO in 2008. It encompasses primary medical care, hospital care, public health and the wider determinants of health. Can the country afford a Living Wage? A living wage has been shown to improve the economy of a country. People are a country’s greatest asset, and our children are our future. Addressing child poverty through supporting a living wage and income is a wise investment in the future. Can the country afford decent housing? Housing is not a cost to the economy- it is an asset, an essential piece of infrastructure, as important, if not more so, as a road, or a bridge, or an airport. Once built it has a monetary value, outside of its contribution towards nurturing the next generation. Can the country afford education that achieve fair outcomes for all? Like housing, education increases rather than decreases, the overall wealth of the community. Barriers to educational opportunities do not make sense – at any age. Does the country have enough money for this? Many of these features will have low cost or even improve the economy. The country has enough wealth to provide for all its citizens if that is made a priority. Currently the country’s wealth is poorly distributed and the provision of basic rights for all citizens is a low priority. The economy has a profound influence on people’s health. Economic policies that prioritise equity, health and social well‐being can improve the health of the people as well as the economy. Does the UCAN Charter cover all the important issues? The UCAN charter covers the issues its supporters see as most important at this time. There are a number of other important issues (the right to education, the protection of the planet from global warming) that we support, but are the subject of action led by other groups. This entry was posted in Uncategorized and tagged Education, Environment, Free Health Care, Health as a Right, Housing, Inequalities, Living Wage, Right to Health, UCAN Health Charter.